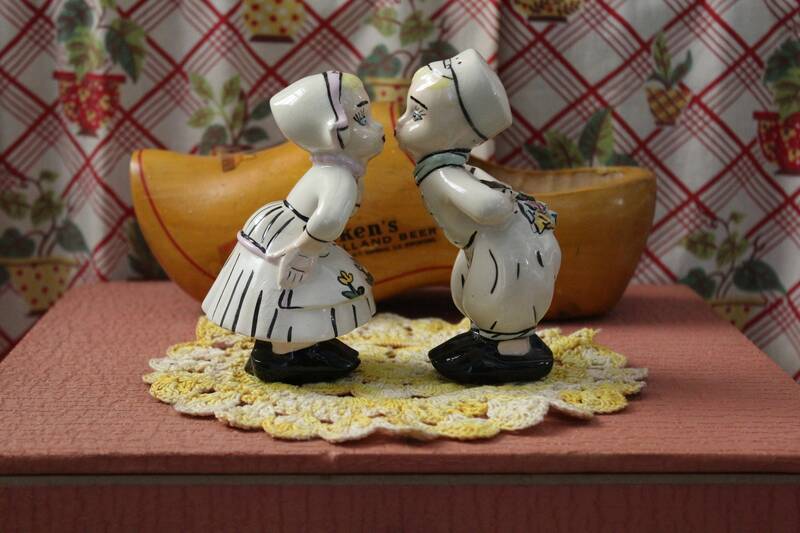 These vintage Dutch boy and Dutch girl figurines are Holland Molds. They are made out of white ceramic with pink and blue decoration. Both have blonde hair and blue eyes. The top of the girl's hat is marked Mom. They are kissing. The boy is holding flowers behind his back. They were made in the 1950s. They would look cute on a shelf in your retro kitchen, garden room, or in a little girl's room. Since they are kissing and the boy is holding a bouquet of flowers, they would make a great anniversary gift. Since the girl is marked Mom, they would also make a great Mother's Day gift. These Dutch boy and girl statues are in excellent vintage condtion. Please use your zoom for a good look.